Part of Ecuador’s draw is its stunning, diverse landscapes. The country boasts lush rainforests, volcanoes, beaches and cloud forests: in fact, its borders extend into the Andes mountain range and the Amazon rainforest—does it get any better than that? Oh, and don’t forget the wonder that is the Galapagos Islands! Visitors don’t have to go far to explore nature, as there is a great spot half an hour outside of Quito which is home to an active volcano and a beautiful cloud forest. The Pululahua geobotanical reserve is not just home to the world’s only inhabited crater, but also holds the Pululahua volcano, which is nearly 3,000 metres above sea level and five kilometres in diameter. It is recognized by some as a powerful energy centre, which draws those seeking a spiritual awakening. Pululahua—which appropriately means ‘cloud of water’—is a phenomenal place to explore those famous cloud forests, which feature a dense cover of fog that hangs over the lush vegetation. The result is a rather mystical scene, which can be taken in by walking into the crater, riding down on horseback, or simply enjoying the view from the top. Walking down into the valley from the lookout point is not for the faint of heart. The steep trail is covered in dirt and loose rocks, and has countless hairpin turns. And remember, if you make it all the way down it just means you have to hike back up! An alternative for those who aren’t up to the cardio challenge is to horseback ride into the valley. There is a little stable (with some rather tiny horses) near the lookout entrance where you can book a trail ride, for anywhere from one to three hours. In terms of pricing, it cost $45 for two of us to ride for two hours—but be sure to negotiate. Those travelling down into the expansive valley are greeted by views of the lush green grass and foliage against a backdrop of rounded hills and volcanoes, all covered in a cloudy mist. There are even a few restaurants and hostels along the way, alongside tiny farmhouses which all seem to have a rather excitable greeting committee of dogs out front! After spending a few hours exploring the crater below, visitors can head back up to Museo Templo del Sol, which just so happens to border the equator. To be clear, the equator itself is actually a couple of kilometers wide, so there is no exact line you can stand on or anything. Anyway, the temple is a recreation of an ancient temple, and houses recovered ruins like old clay pots. A rather photogenic spot, it resembles a castle and has huge sculptures scattered around the site. Museo Temple del Sol is also home to renowned Ecuadorian artist Cristobal Ortega Maila, whose works are displayed on the two upper levels of the building, along with his studio. Entrance is $3 per person, and includes a guide. El Crater Hotel and Restaurant just so happens to be perched right along the rim of the crater, affording absolutely stunning views of the surrounding landscape and valley below. Oh, and it has a resident llama! The hotel itself only has a dozen rooms, making it a picturesque, quiet retreat from busy city life. It is also a popular stop for tour groups, so you don’t necessarily need to book a room to check out the premises. The rooms are well-appointed, including a large king size bed, private bathroom, and a sitting room complete with couch and TV. However, there’s no question the best part is the view, as there are two huge windows on either side of each room. One looks out of the front of the hotel where you can see the winding hills leading back to the city, while the other stares directly into the crater. Incredible! The only downside at El Crater is the food. The included breakfast is amazing (think freshly scrambled eggs and a well-laid out fruit plate), but the lunch and dinner offerings are nothing to write home about. It’s also pricey, especially by South American standards—like $8 for a bowl of mushroom soup, or $15 for a subpar plate of chicken and vegetables. Unfortunately there aren’t really any other dining options around. 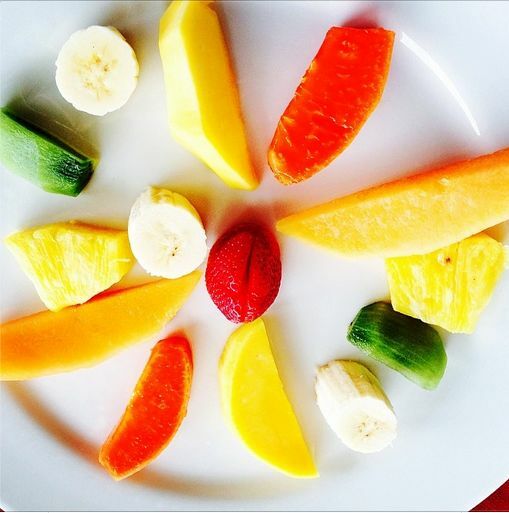 A colourful breakfast at El Crater. One final note: that amazing view you travelled for could be obscured by the very thing you came to see: clouds! Water clouds can make it extremely foggy, meaning you won’t be able to see much beyond your hand, much less the landscape. How to get there: The drive out from Quito costs about $25-$30 in a taxi, and takes around half an hour. However, if you’re going from El Crater to the airport, expect to shell out $50 for the drive, which takes an hour and a half (I wish I was exaggerating!). Alternatively, take the Mitad del Mundo bus from Quito. A visit is also possible as part of a tour from Quito. The big surprise: While art is a big thing in this area, visitors may be a little taken aback at some of the pieces adorning El Crater’s common areas. Be warned, the bathrooms are basically adorned with nudist pieces! The vistas surrounding El Crater Hotel.